Brought to you by Purina and TheCo. Animals have been a part of my life for as long as I can remember. Growing up, we had dogs who were loved family members. Czar, our black lab, was the gentlest soul I’ve ever had the pleasure of knowing. Many people commented that he was such a special dog. He was the only dog I knew that actually smiled when he saw you. Zoe, our boxer, was loving and sweet. Despite her size, she would often climb into your lap wanting to be held. Sadly, both have passed away and I still shed tears thinking about them and how much I miss them. Fast forward to today and I have a family of my own. The funny thing is that there are no dogs in my home; instead, we have three cats! I didn’t grow up with cats and was only exposed to them at my friends’ houses. Now I can’t imagine my life without my fur babies. I’ve become a full-fledged “cat person”. I’ve thought about getting a dog, but I know my cats would be too upset! I’ve mentioned my cats, Misty, Princess and Reggie, on my blog before. Just in case this is your first time here, I’ll introduce them to you. Misty and Princess are sisters, though they look nothing alike! They are five years old with completely different personalities. Misty is shy, quiet and gentle. She loves to cuddle and will sit on me during the day while I work on the computer. On the other hand, Princess is bold and forthright. If she sees something she wants, she will not hesitate to go after it. She sits on top of the couch beside me and stares intently at me as I work. It sounds creepy, but it’s not! I know she’s doing it out of love. Our newest family member is Reggie. 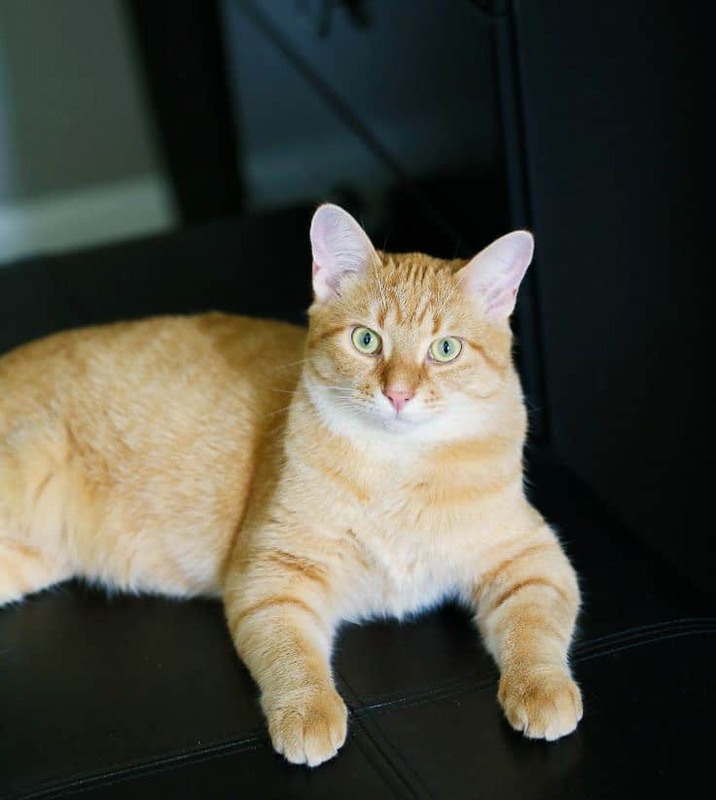 He’s a feisty orange tabby who quickly became the dominant cat in the home. What Reggie wants, Reggie gets! He’s playful and funny. His antics make me laugh daily. He’s a joy to have around. 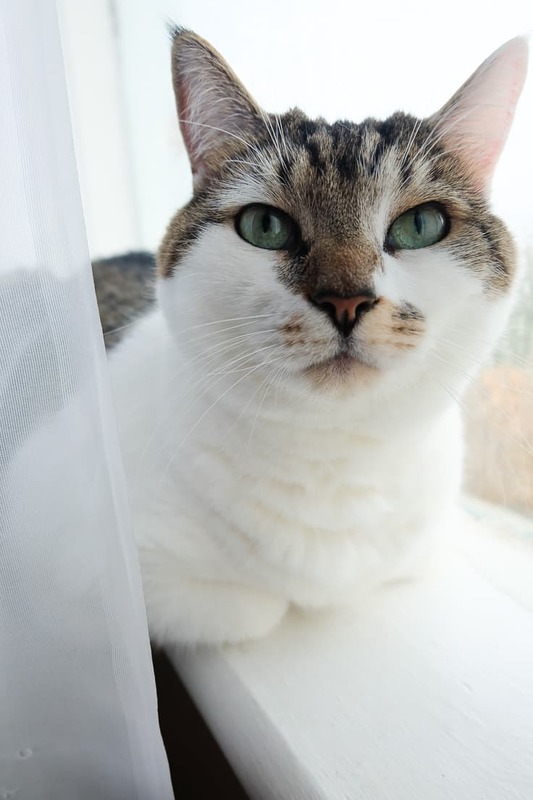 He likes to sit in the living room window and coo at the squirrels and birds outside. He also likes to jump on the counter when I’m trying to make supper. Little rascal! Purina Canada recently launched their Purina Pet People Campaign and are asking what being a pet person means to you. I gave this question some thought and how it applied to me personally. I have several reasons why I would consider myself to be part of the #PetPeople tribe. 1. My cats are my babies. Even though I didn’t physically give birth to them, I’m still their mom. I only want the best for them and care about their comfort and well-being. 2. My personal social media accounts are full of animals. I have friends tag me on Facebook all the time when they find a cute cat video. I like more animal Facebook fan pages than I do ones owned by people! I think that fact alone makes me a bonafide pet lover. 3. I love to spend time with my cats. Nothing beats cuddling with a warm furry friend who loves to give kisses. I don’t even mind the rough tongue. 4. I want more. 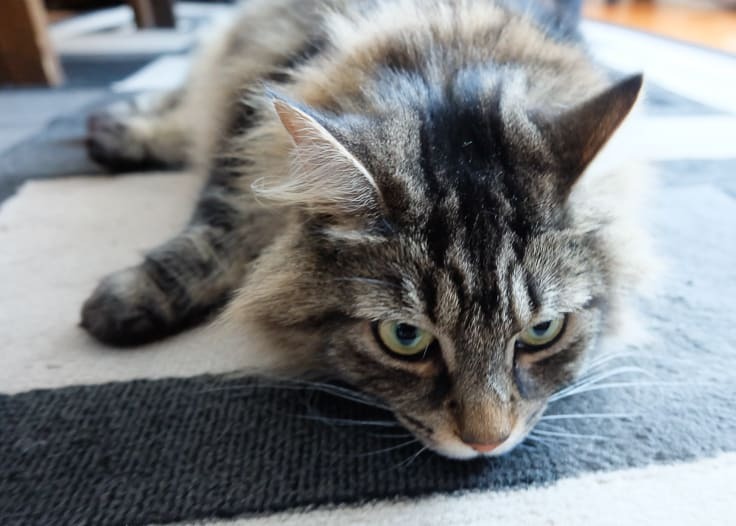 I would love to adopt another cat, but my husband doesn’t think it’s a good idea. Still, I can’t help but long for another fur baby to love and care for. 5. I get emotional leaving my cats at home. I don’t travel too often, but when I do, I miss my entire family, cats included, dearly. I’ve skyped with Reggie, Princess and Misty. Reggie goes nuts and swats the screen trying to figure out where I am hiding. Watch Purina’s We Are #PetPeople video and see if you can relate to what these pet owners have to say. I found myself nodding my head in agreement! Purina Canada is calling all #PetPeople across the country to share what being #PetPeople means to you, or what makes you #PetPeople. Give your reasons and share a photo on Twitter or Instagram tagging @PurinaCanada and using the hashtag #PetPeople and you could win a feature in an upcoming coffee table book starring real #PetPeople from across the country! I’ll be in it too! What a meaningful and awesome prize to honour that special bond between pets and pet owners. The winners will also receive a limited edition copy of the book to enjoy in their home. Check out the rules here. What does being #PetPeople mean to you? Disclosure: This post was sponsored by Purina #PetPeople, but the opinions expressed are my own. Being a pet person means just being me. I’ve had dogs for as long as I can remember. I’d have cats, too, if I weren’t deathly allergic. Your cats are so cute. I can totally tell how much you love them. Your cats are so beautiful! I have had cats for as long as I can remember too. I got my first one for Christmas when I was 2 years old, and I have never gone more than a year at a time without having a cat in my life. I have two currently, and they mean so much to me. Our dogs were our first babies, furbabies, you could say. Funny thing is they share the same birthday as our first born, so we always celebrate all of them together. We have pets that we love at our house too! My husband would have 100 ore dogs if we had room for it! 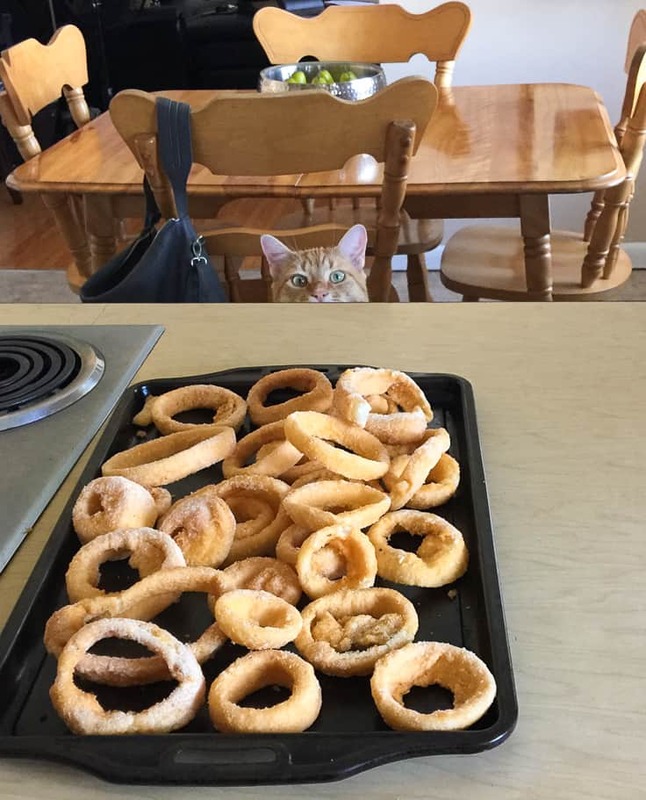 I love the onion rings pic, took me second to see Reggie, then LOL! I am a HUGE pet person. I miss having my pet (they passed a few months ago). I can’t wait to get a new dog it just seems empty in the house without them. Your kitties are so precious! I can tell how much they mean to you just be reading your post. I love that Reggie is the newest member to the family but already runs the show! Your cats are oh so cute. Reggie looks exactly how my kitten, Tigger will look when hes bigger! We are huge pet people too, and I love this campaign! So fun. Awww, so cute! We are definitely pet people! I have 2 cats myself! I am a huge pet person myself, and your are adorable. I can’t wait to get a house so I can adopt cats and dogs, it will be so much fun! Those are adorable cats. My son has been wanting a cat for so long. We love our chocolate lab, he really is part of our family. Aww they are so cute. 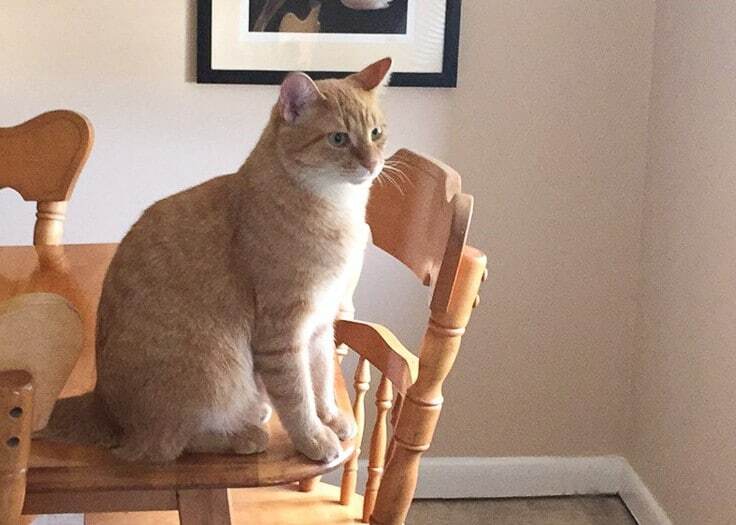 Our cat definitely likes to jump on the counter too but only when we’re not looking! Your cats are very beautiful. I have two cats and they’re actually brothers. I would love to get more pets when I’m able to. I would like to have a dog as well. I absolutely love pets! You really have some handsome cats! We have two, Meep and Hazel. We are pet people too! I truly love being a pet people. My fur babies are my life and I could not imagine them not being in it. I am proud to be a cat lady. I would love to have more but my kids would object. These are great photos. Your cats are adorable. Most of my friends are pet people and i love to go to their homes and play with their pets. ah I love your babies! I’ve always wanted a white kitty. and seriously, him peeking over the counter? hiliarous! We are definitely pet people too and can’t imagine our life any other way. We are Pet People too, we never leave them at home on a holiday, they get the run of the house with their own comforters and beds, I love them and no matter how much a vet bill if they need it , even if we don’t have the cash I will make it happen. Your cats are gorgeous and you can tell they are loved by how they look. Our fur babies are like our kids! I love my pets! We have quite a few animals too! I don’t know what I’d do without each and every one of them. With 3 cats you most certainly qualify as a cat lady. All of your pets are so beautiful and really good at modeling for the camera too. Adopting a pet can be so rewarding for both the pet and owner! Have always been a pet person they bring such joy and unconditional love and we have always treated them as a family member. Love it! I am a proud pet owner too! We have a rabbit and two kittens right now! Adoption is a great way to go! I want more! I live in the US so I know that I can’t win. I just wanted to tell you that we had a collie when we were growing up and he would smile at us. It was so cute. Thanks for the memory.